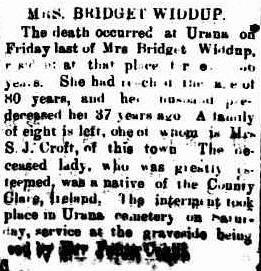 Bridget WIDDUP nee O’BRIEN from Ballykelly. Today I’m going to focus on a family member, Bridget Widdup, from Urana in southern New South Wales. I made brief mention of Bridget in my introductory post, as she was my Mary O’Brien Kunkel’s sister. I only came to know of Bridget through oral histories from Mary’s granddaughter, Anne Kunkel, and then distant cousins in Sydney. In this I was enormously lucky, as I was with Bridget’s and Mary’s longevity and their unusual married names. I was able to buy Bridget’s death certificate many years ago and it gave their place of origin as Broadford in County Clare. It also told me that Bridget had spent a year in Queensland confirming another point in the family’s oral history. Other research pinned their townland down to Ballykelly in the hills near Broadford, which belongs to Kilseily parish. Over the years I’d visited the State Library of New South Wales and looked in newspapers for obituaries or death notices for Bridget, always looking for more clues. None provided anything additional to the other documentary information. How fortunate then, that Trove is here to help us and with the on-going digitisation program, more and more newspaper articles are being revealed. It was one such which told me that Bridget had spent her Queensland year in Ipswich. In retrospect that should have been obvious but….You can read the serendipitous migration discovery which arose from that here. I am confident that the advertisement ties the two women together, and that Bridget must somehow have been on the Florentia. Much of the family’s oral migration story fits together with that discovery. Unfortunately I have been singularly unsuccessful in tying them into the official documents despite trawling the archives. I can only assume that Mary’s advertisement was successful given that she knew her sister’s married name, and they apparently remained in touch. We have no idea why Bridget left Queensland heading for New South Wales. Perhaps she had indeed met her future husband on board ship as I believe he was a sailor and have found a merchant seaman whose details fit. Perhaps her Queensland employer also had property in NSW. Perhaps she just didn’t like the hotter weather in Ipswich. Whatever the reason, Bridget married her husband John Widdup, apparently in Albury, though repeated searching has been unsuccessful. They had nine children: Amelia, Louisa, John, Michael J, Walter Ireland, Alfred England, Martha, Bridget Ellen and Catherine Agnes. One question, long in my mind, is why both Mary and Bridget each named a daughter Louisa as it’s not a traditional name in their families. One thought was it might have been the name of the ship they were on, but further research eliminated that possibility too. 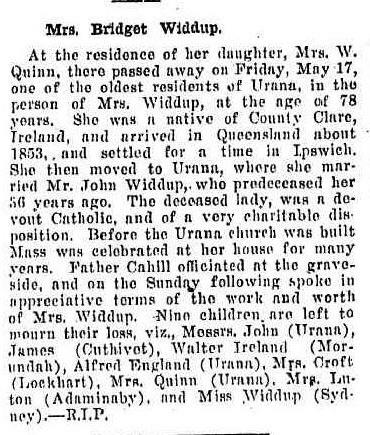 The Widdup family lived and worked in Urana. Bridget helped establish the Catholic church there and oral history from Irish relatives recalled that she had Mass said in her house. Husband John was heavily involved with establishing the Urana school. He was also poundkeeper and after his early death (not registered) in 1876, Bridget became poundkeeper – another Trove discovery. In 1901 Bridget was accepted for the Old Age Pension, a little surprising given her land-holdings. 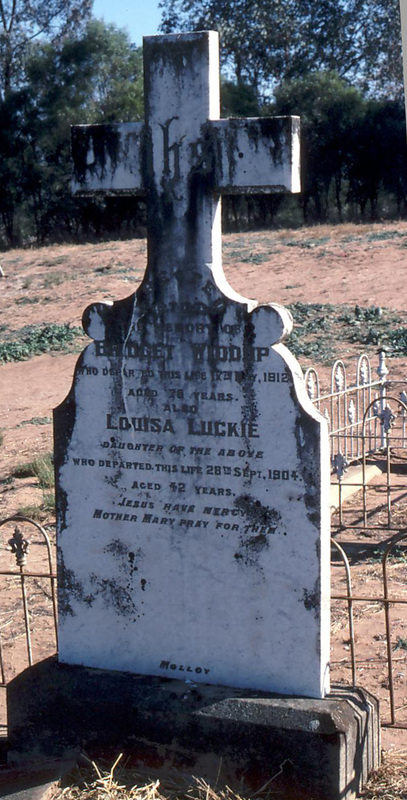 Photograph of Bridget’s grave in the Urana Cemetery. Pauleen Cass c2002. Over the years Bridget purchased several plots of land in the Urana area, and seems to have taught herself some basic literacy as her signature is found on her husband’s probate documents. Bridget and John are buried in separate areas of the Urana cemetery, reflecting their religious differences. And yes, I’m waiting (im)patiently for an upcoming Trove release from the Wagga Wagga Express which tantalisingly says “Mrs. Bridget Widdup, a colonist of 55 years, who landed in…”. Will Trove pull the cat out of the bag again, and give me another pivotal clue? I’d also dearly love to make contact with any of Bridget O’Brien Widdup’s descendants. I’s also love to see a photo of Bridget – I have photos to share of her two closest sisters, Mary and Nora, and lots of the family story in Ireland as well. 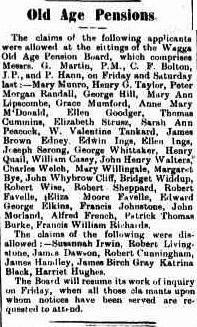 This entry was posted in Ballykelly, Broadford, Emigration, Florentia (1853), Queensland and tagged Ballykelly, Bridget O'BRIEN, Bridget WIDDUP, John WIDDUP, Mary KUNKEL by cassmob. Bookmark the permalink. Hello there Pauleen. I lost your email address when I had a computer crash. I haven’t found out anything genealogical, but would be interested to hear of any news discoveries you have.